How long does it take to to get the turf delivered once it is ordered? Generally, it takes around 2 weeks from the time your order is placed to the time it is delivered to your premises. Why Should I choose Synthetic Turf? 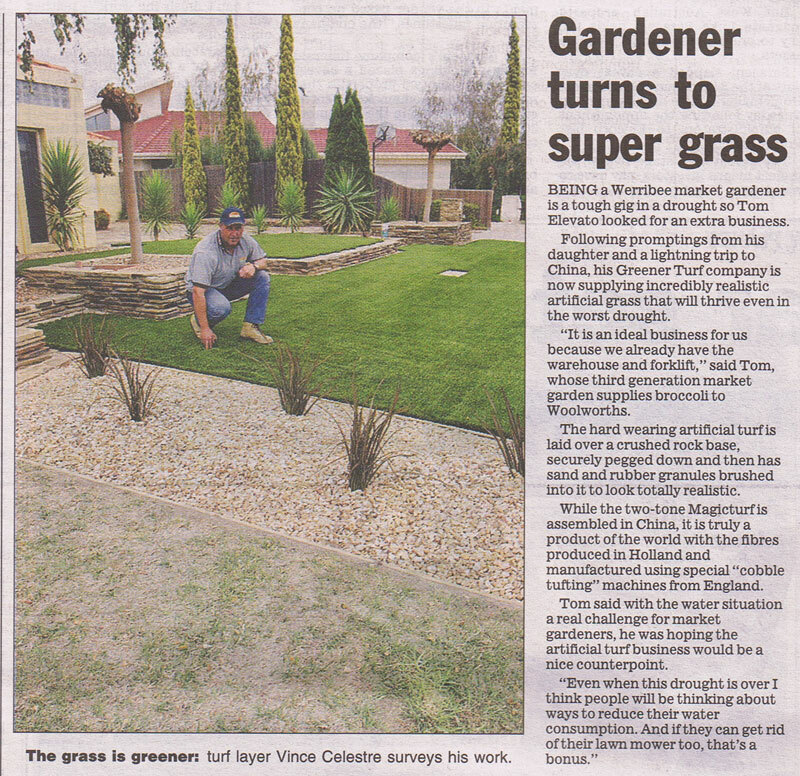 Synthetic Turf does not require mowing, watering or fertiliser, therefore saving you valuable time and often proving to be more economical with no mowing, irrigation, fertiliser and watering costs. How can I order synthetic turf from The Greener Turf Co? You can send a query from our website, contact us by phone or send an email to info@greenerturf.com.au and we will arrange an obligation free quote. We recommend installing by a professional installer, if you do not have one we can arrange one of our professionally trained installers. The turf is installed over a crushed rock base or concrete. If there are joins they are done using our seam tape and special adhesive. Dry sand and rubber are spread on top of the turf whilst the machines goes over it to sit up the fibres. How is our synthetic turf different from others? Our turf is made from the very best materials from Holland which are designed to look and feel like natural grass. The two tone coloring of our MMN turf gives it a natural look and the poylene fibres and the polyethylene fibres along with the low side resistance provide a soft and natural feel underfoot. How long is our synthetic turf guaranteed for? Our synthetic turf comes with a 7 year warranty against wear and tear under normal use conditions. With moderate use and good care our synthetic turf should last in excess 12 years. Will our synthetic turf fade? The high quality polyethylene materials that our synthetic turf is made of has a high UV protection to minimise fading and deterioration. It has successfully passed the worn simulative aging test for a period successive of 8,000 hours, which can be compared to 5 years exposure to East African climate conditions. Like most synthetics however there is minimal possiblity of slight fading from exposure to sunlight over a period of time. Our synthetic turf is extremely low maintenance. Keeping our turf clean is just like real grass, a rake or blower can be used to remove leaves and rubbish. Weeds can be pulled out by hand if there are any. The polyethylene materials used in our turf make it resistant against staining, however it is recomended that spills be promptly cleaned. The perforated carpet backing in our synthetic turf is designed to allow the draining of water. Thje sand infill will help absorb and hold water with the excess running off the top as with natural grass. Can synthetic turf be installed anywhere? Synthetic turfcan be installed anywhere and cut to any shape or size. Unlike natural grass, natural sunlight is not required nor a soil base, allowing synthetic turf to be installed in shaded areas, al-fresco areas, rooftops etc. Synthetic turf is a great alternative to natural grass when surrounding pool areasas it does not require mowing allowing your pool area to stay clean.